A platform rollator that is revolutionary Breakthrough in Mobility! 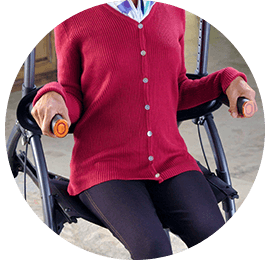 The UPWalker is designed to improve mobility and increase independence for the elderly and mobility challenged, including users with neurological, orthopedic, cardiovascular and other health disorders. 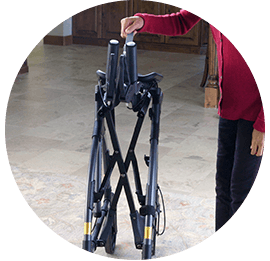 According to clinical research, the unique design of the UPWalker can reduce pain in the wrists, back and leg joints as compared to traditional walkers, and the upright position may enable users to walk farther with less effort. 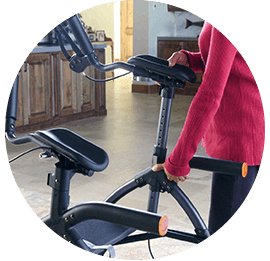 The UPWalker has been shown in a research study to unload body weight from the lower limbs and reduce back and lower limb pain as a result. The upright armrests also reduce pain in the wrists and hands that can occur with traditional walkers and rollators, especially if you have arthritis. Product comes fully assesmbled. Adjustment can be made to fit your personal preference and need. Does the UPWalker include a seat? Yes, a fabric seat that slides front to back for sitting or walking with long strides. Also comes with comfortable backrest support for sitting. What material(s) is the UPWalker made of? The sturdy frame is made from aluminum alloy and other quality materials including composite plastic and polyurethane. Many of these materials are used in the automobile and aircraft industries. The wheels are 8 inch diameter made of soft high-quality TPR Rubber (not inflated). The armrests and handles are made from a comfortable foam polyurethane material that is easy to clean. Does the UPWalker come with brakes? Yes, with comfortable ergonomic handles. Brakes stop rear wheels. Brakes also function as parking brake for sitting or standing from seated position. Does one brake stop both wheels? How much does the UPWalker weigh? Standard UPWalker (H200): 23 pounds. Small UPWalker (H200-S): 21 pounds. Large/Tall UPWalker (H200-L): 25.5 pounds. What are the dimensions of the UPWalker? Standard UPWalker (H200): 33.5 inches long (wheel base) x 23.5 inches wide (outside width). Small UPWalker (H200-S): 30.5 inches long (wheel base) x 21.5 inches wide (outside width). Large/Tall UPWalker (H200-L): 36 inches long (wheel base) x 25.5 inches wide (outside width). What is the inside width of the UPWalker? Standard UPWalker (H200): 17 inches. Small UPWalker (H200-S): 15 inches. Large/Tall UPWalker (H200-L): 19 inches. What is the narrowest door opening that the UPWalker can pass through? The Small UPWalker is 21.5 inches wide and the Standard UPWalker is 23.5 inches wide and will go through most doorways. The Large/Tall UPWalker is 25.5 inches wide and will require wider doorways than the Standard or Small units. What are the dimensions of the UPWalker when folded for storage? Standard UPWalker (H200): 33.5 inches long x 10.5 inches wide x 37.5 inches high. Small UPWalker (H200-S): 30.5 inches long x 10.5 inches wide x 35 inches high. Large/Tall UPWalker (H200-L): 36 inches long x 10.5 inches wide x 40 inches high. Standard UPWalker (H200): 18 inches wide x 11 inches deep. Small UPWalker (H200-S): 16 inches wide x 10 inches deep. Large/Tall UPWalker (H200-L): 20 inches wide x 13 inches deep. What is the height of the seat from the ground? Standard UPWalker (H200): 20 inches from the ground. Small UPWalker (H200-S): 20 inches from the ground. Large/Tall UPWalker (H200-L): 21 inches from the ground. Can I transport the UPWalker in my car? Yes, the UPWalker folds easily for storage and transport. It fits in the trunk or back seat of most cars. Can I use the UPWalker in my home? 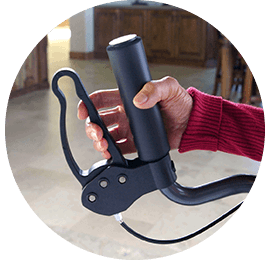 The UPWalker is designed for everyday use in the home or living facility. It will go through standard sized doorways and is easy to maneuver on a variety of surfaces. 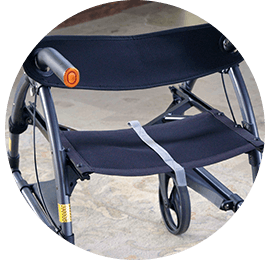 The UPWalker includes numerous features that make its use indoors comfortable, convenient and safe. The Regular (H200) and Large (H200-L) UPWalkers are longer and heavier than traditional rollators, however, and may not be suitable for use in some multi-level homes, small living quarters such as mobile homes and apartments. Can I use the UPWalker outdoors? The UPWalker works very well outdoors. 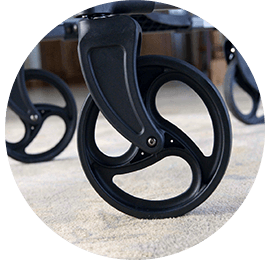 With 8 inch wheels, a sturdy frame and reliable handbrakes, the UPWalker can be used safely on a variety of walking surfaces. The UPWalker includes a seat with backrest, personal item bag and beverage holder that will make your outdoor walking experience convenient and comfortable. What are the sizes of those bags? Standard personal item bag: 13 inches wide x 6 inches deep x 10 inches high. Luxury personal item bag: 13 inches wide x 6 inches deep x 10 inches high. Shopping bag: 18 inches wide x 11 inches deep x 12 inches high. What accessories come standard with the UPWalker? The current offer includes a personal item bag, a beverage holder and a backrest support. What optional accessories are available on the UPWalker?